The 220 kids at Kyaseni Primary School had been told of our expected visit. Some of them were so excited about the ‘guests from USA’ coming to their school that they were unable to sleep the night before. International visitors are a rare happening in this mountain village. Our group was warmly welcomed by the Headmaster and we were invited to sign the school’s Guest Book. We then spent time with the school’s eight teachers, happy to meet and share conversation and questions about our respective lives, work, and challenges. Talk eventually turned to ‘water’ where we were told that “the lack of water is the school’s biggest problem”. Our Water Project Manager Alphonse Ngowi had attended this very same primary school some 60 years ago. Years later, he had built with his own hands the small building that is still being used as a kindergarten today. With this personal connection, the possibility of bringing safe water to Kyaseni Primary School kids carried a special excitement for all of us! 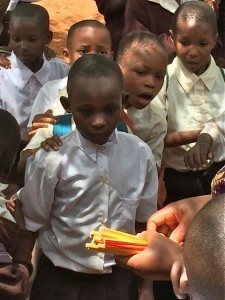 The Uru Safe Water Project is a community participation project, so the Headmaster and teachers were provided with the required next steps for water connection to their school. Simply said, they must write to our local managing partners for connection, the technician will then visit the school to provide particulars of connecting to the Maji ya Uru (Uru Water) system and then the school committee (parents and administrators) must agree to cover the small fees for metered water usage. These minimal fees ensure that repairs can be made to the system for sustainable safe water supply. With water discussions finished, our group presented the teachers with school supplies that had been generously donated by American friends and family, which Jean and Lee Ann had collected and carried to Kyaseni. 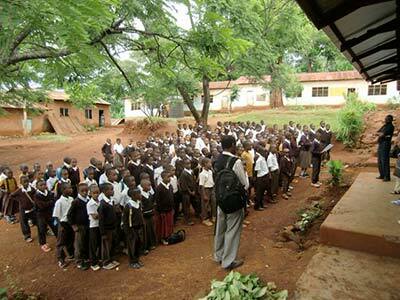 The kids were then called into the school yard where they exuberantly sang the Tanzania National Anthem. A student proudly stepped forward and read in a clear strong voice a beautiful ‘letter of welcome’ to us, that included info about their school and students. The letter ended with a request for help in finding a primary (elementary) school in the USA that they could correspond with, as friends. 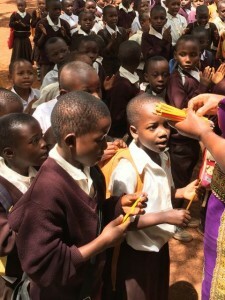 With thanks all around, the teachers began passing out pencils to each child from the donated supplies. The kids got quiet at first and then almost magically, every pencil in every child’s hand became a celebrated treasure. From awe to smiles to jumps for joy, every pencil was held, cradled, and appreciated like no pencil ever before. In that moment, the power of a simple pencil to brighten the heart of a child reached even further, as each of us felt the blessing of this pure gratitude illuminate our own hearts and minds, too. CONTACT US to connect your elementary school with Kyaseni Primary School. CLICK HERE TO DONATE for safe water development in Uru villages.